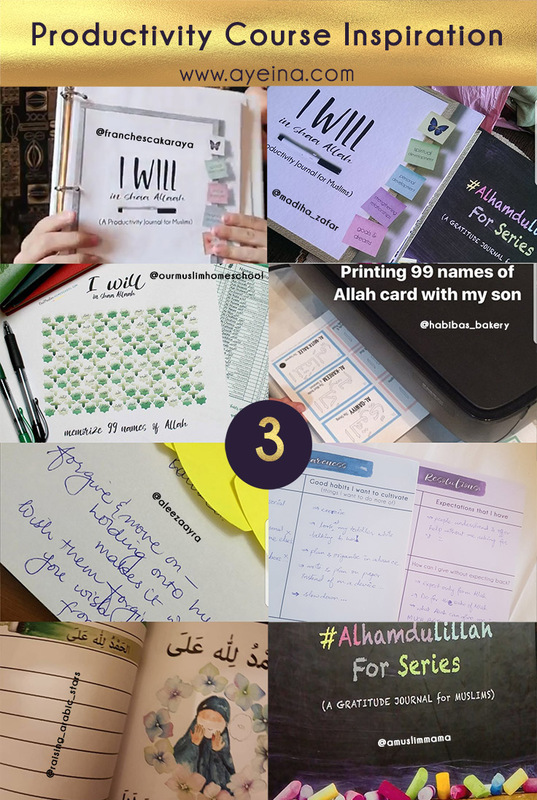 In December 2017, We picked Memorization Tracker (for 99 names of Allah) ((to help us know our Creator better through His perfect names), Self Awareness ((to help us ourselves from deep within – looking into our good and bad habits and exploring where we want to spend more/less of our time), Personal Resolutions (to improve toxic relationships and move on from the hurt, grudges and expectations) and Gratitude List (to turn negative experiences of life into positive lessons). 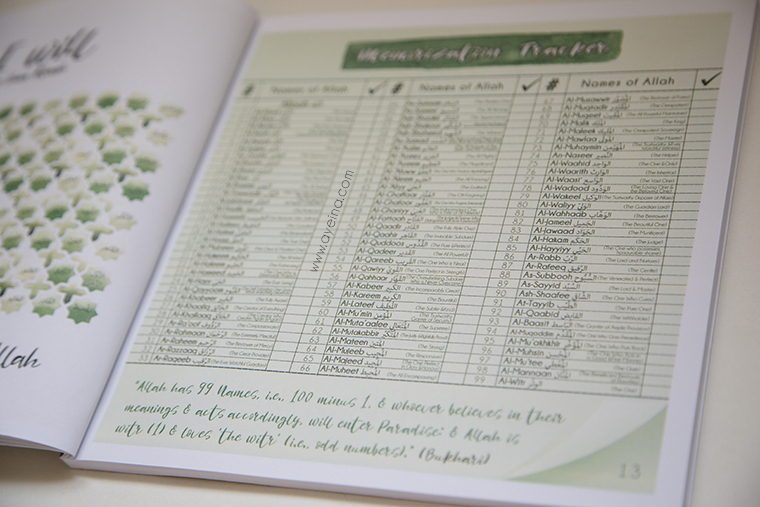 Challenge 1 of #PreRamadanProductivityCourse was “Memorizing 99 names of Allah” in *Spiritual Development*. For those who have the productivity journal, this memorization tracker with the whole list (based on 99 names authenticated by Sh.Uthaymeen) is on page 13. We included this as a first step in the journal towards spiritual development because TAWHEED is the basic pillar of Islam and to know your Creator better is the way to get your life together. Without the knowledge of who Your Lord really is, you may not be able to build that spiritual connection with Him. The connection of love, fear, respect, dependency and most of all – a connection of communication – connection of dua! “Self-Awareness is one of the most impactful tools that can help you achieve your personal and professional goals. Self-awareness allows you to have a clear perception of your likes and dislikes, strengths and weaknesses, and values and beliefs. It’s about knowing what motivates you to get going and get something done. And this information can not only help guide your actions and decisions, but also allow you to make the most of your best personality traits. Self-awareness helps you understand what skills come naturally and easily to you as opposed to what always feels like a struggle. The only requirement of the self-awareness journey is that you fully accept yourself and the “package” of strengths and weaknesses that you’ve been blessed with. Do this without judgement and let yourself be open-minded. Self-awareness is important because if you make your decisions keeping your personality traits in mind, you become selective about where you spend your precious and finite energy. It’s only human to be good and bad at different skills. Some people can easily speak in front of large audiences, while for others just the thought of such a task brings sweat to their forehead. Some people are great visionaries and can come up with great ideas, but their tendency to view the big picture may lead them to forget the little details that will actually bring their ideas to life. Some people may be bad with numbers and logic, but they might be the social butterfly who is able to easily network and make connections. Key is to understand yourself, and use your strengths to get to where you want to, while building partnerships with people who make up for your weaknesses. Years and years of social conditioning and just being comfortable with yourself can often blur these lines for us. So how can you become more self-aware and find out your strengths? Keep a journal (keeping a journal is one of the best ways for you to think through your thoughts and write them out – our minds are busy places, but writing something down forces you to shuffle through all the thoughts and get them down on paper where they are visual and there for you to see), ask someone who knows you (approach a friend, spouse, or even a colleague and ask them 3 things that they think you are very good at) and take self-assessment tests. 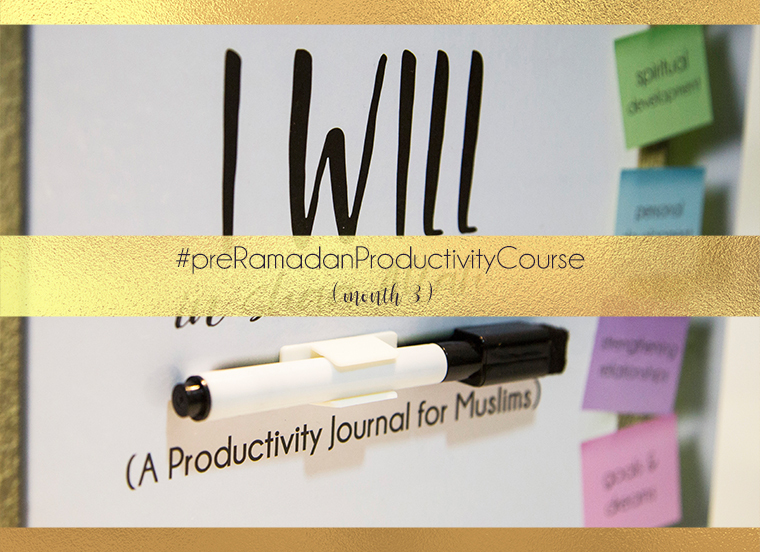 Challenge 3 from *Strengthening Relationships* was “Personal Resolutions” in #preRamadanProductivityCourse – This revolved around forgiving without grudges and giving without expectations (in short – managing our unnecessary expectations). Ask yourself if you are stepping forward in life while carrying unnecessary disappointments due to many expectations that you have in this dunya? And how can you turn their focus into expecting things only from Allah…Dig a little deeper and see what still hurts? It could be something from the past or even something recent. Has anyone ever hurt you so deeply that you were unable to forgive them for a long long time? 1) If you have certain wants that you wish others to fulfill, it’s BEST to communicate it to them – after which, they may fulfill your wishes or they may not. But when you DON’T communicate, probability of you having your wish fulfilled by this person is very low. 2) The next step is freeing ourselves from others fulfilling our wishes and we taking a step towards the fulfillment of our own desires ourselves. To take responsibility of ourselves in our own hands. 3) Expect only from Allah. Now this step is hard of course, BUT one that never leads to disappointment. Either we get our wants/expectations fulfilled in this dunya – or in the aakhirah (or even both). 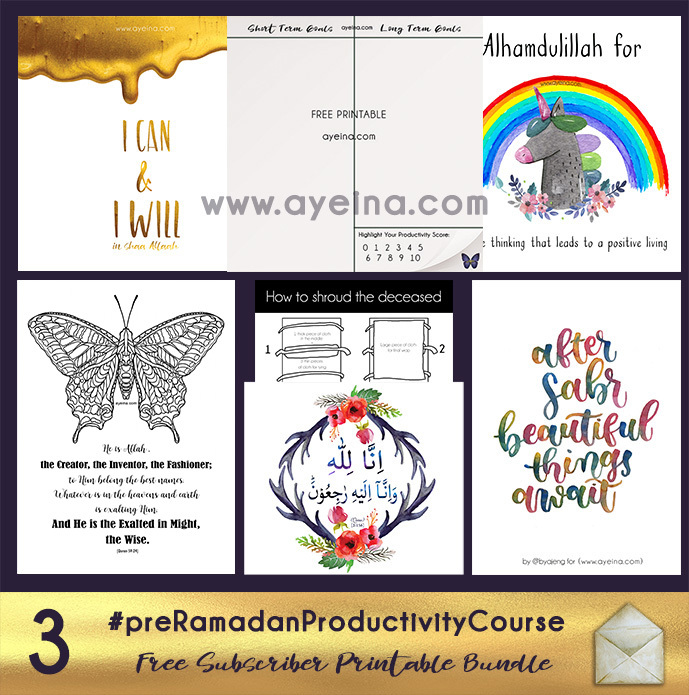 Challenge 4 from *Goals and Dreams* category was “Gratitude List” in #preRamadanProductivityCourse – which highlighted how to be positive amidst negativity. Since we usually talk about how to teach the topic of the week to kids as well (and we had already discussed it from an adult’s perspective HERE), we briefly discussed “HOW TO RAISE GRATEFUL KIDS” in #preRamadanProductivityCourse hence. 1) Set an example by saying JazakAllah khair to them often (plus it’s a dua you’d be giving your children without having to think that you’re spoiling them by saying this). 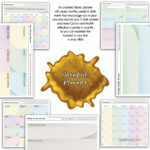 2) Fill out a Gratitude Journal together. 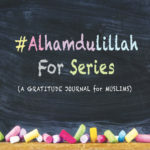 Be it #AlhamdulillahForSeries like we used above or any simple diary that you can turn into a gratitude journal. 3) Having a diverse set of social circle – if you and your kids are constantly spending time among people who are equal or better in terms of finances/status etc. Chances are slim that you will develop the kind of empathy and gratitude that you can develop by spending time among people who are from different backgrounds and experiences. 4) Minimalism – it helps kids stay more focused and more focus means more reflection and self awareness of what THEY have. And obviously, minimalism starts with you. 5) Less exposure to ads etc. (Especially if they are targeted towards kids) – something that usually diverts the focus to consumerism. Why? Because the hadith says: “Look to one who is lower than you, and do not look to one who is above you. For indeed that is more worthy (so that you will) not belittle Allah’s favors upon you.” (Tirmidhi) – In Shaa Allah kids will eventually learn self control with time as well. 6) Thank those who serve you in any way. Your example of acknowledging those who quietly make a difference in your life, from the bus driver to the person sweeping up the floors, sends a powerful message to your children. 7) Involve yourself and your kids in charity. Especially volunteering with your presence. This will not only expose the kids to those who are less fortunate but will also help them know that charity doesn’t require “having” loads all the time. These challenges and activities are amazing! 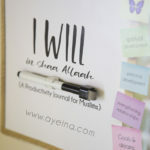 Many self-growth resources out there often don’t have an Islamic touch to it, this was inspiring. I’m hosting a leadership camp for girls soon – will definitely be making use of this. 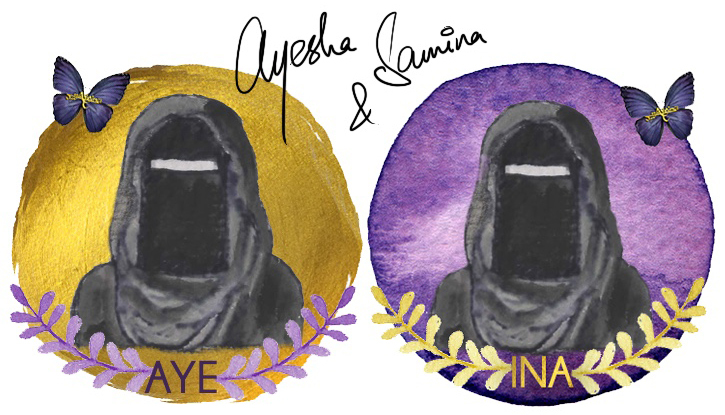 Masha Allah Zahraa! Please let us know how these challenges work out in your camp. JazakiAllahu khair for your valuable comments! Forgiveness and Gratitude…such a powerful words….thank you for writing this post…love the pointers mentioned in the post…. So glad that you loved it. Life becomes so beautiful when we can forgive and be grateful for every little bounty. SubhanAllah! Ameen! JazakiAllahu khair for your duas! Really love your challenges. Love how you always bring in remembrance of Allah into everything. May Allah reward you both abundantly, Ameen. Ameen! Alhamdulillah. So happy that you enjoyed reading it! Some great challenges….agree that number 3 can be slightly difficult…but as you say something we should do. I feel you FOzia. It is difficult, but not impossible to accomplish. May Allah make it easy for all of us! These are challenges that we all experience in our lives and the way you guys take up each challenge and break it down into simple steps and small tasks is amazing. May Allah reward you for your efforts. Aameen! Breaking down any task makes us feel less overwhelmed. We are all in this together. Let’s get going with each one of them. Ameen! Happy that it was helpful.